Enheduanna, Oriental Dancer and Belly dance instructor. Bellydance classes available. Beginners and Intermediates. An Oriental Dancer dedicated to a professional and artistic representation of Middle Eastern Dance. Known for her fluidity, technique, and richly expressive interpretation of Arabic music, she performs in Middle Eastern venues from Los Angeles to San Diego. In South Orange County, California, she teaches the Art of Oriental Dance, exploring many different aspects and styles for a broader understanding of this classical art form. An introduction to the Art of Oriental Dance, the classical dance of the Middle East and North Africa, known for its earthy power and fluid femininity. Learn the basic hip techniques, shimmies, and muscle control of this fascinating dance form. A fun and exciting exercise - and a great way to stay fit in a supportive atmosphere. No experience necessary. Orange County Classes taught in Laguna Hills, Dana Point and San Clemente. 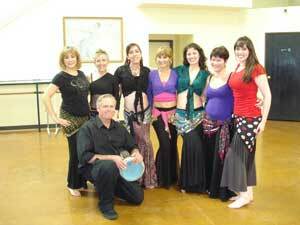 Bellydance classes available for Beginner through Advanced students. For 19 years Tina Enheduanna has been dedicated to the professional and artistic representation of Middle Eastern Dance. Known for her fluidity and her richly expressive interpretation of Middle Eastern music, she performs in Middle Eastern venues from Los Angeles to San Diego. In South Orange County, California, she offers 4 levels of instructions, exploring many different aspects and styles for a broader understanding of this classical art form. This dance is known for its earthy power and fluid femininity. It is presented as a fun and exciting workout in a supportive atmosphere. No experience necessary. Students perform in an annual Recital which benefits Women for Women International. More Information: www.enheduanna.com, or call Tina~Enheduanna at 949-842-5989, or email Tina@Enheduanna.com. Tina Enheduanna in Person! Tina performs at several locations weekly at Middle Eastern venues. She is also available for private parties, weddings and other celebrations, including performance-and-teaching combination parties for showers and women's events. Contact her for public performances coming up.